This Recycled Timber Table HB is currently in our showroom at Currumbin oiled and ready to go. With crossed legs, benches tuck neatly underneath for storage which is a handy option if space is limited. No apron on this table allows for chairs with arms to slide under easily. The Recycled Timber Table HB is heavy 50mm mixed recycled hardwoods, complete with holes from where the nails used to be! It’s not a large table, but even with massive 70mm x 100mm hardwood crossed legs there’s plenty of leg space for diners. The Recycled Timber Table HB wasn’t designed to seat a large number of people, two down each side and a generous overhang to allow one comfortable space each end. 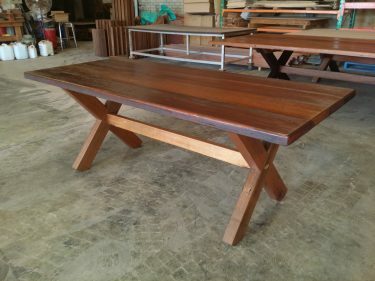 This Recycled Timber Table HB was made to order and can be reproduced to suit your size, style, colour or timber choice. 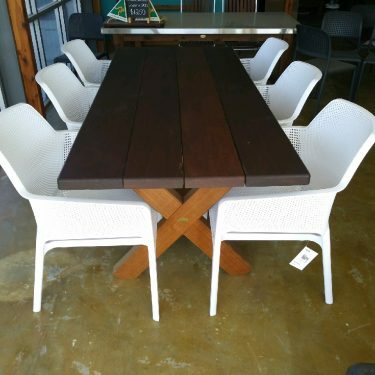 Why settle for a table made to suit the majority and not you and your indoor/outdoor area specifically? 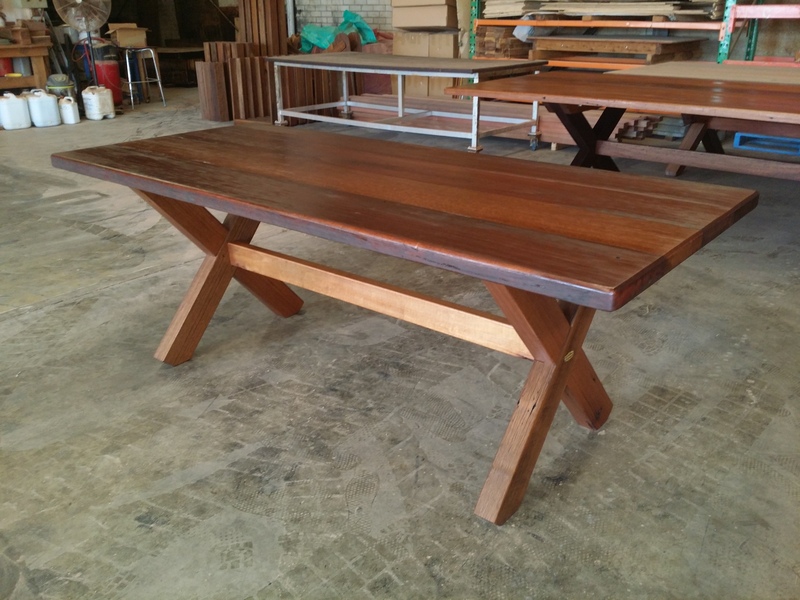 This Recycled Timber Table HB is part of our The Solid Timber Man recycled range manufactured from scratch on site at our factory in Queensland. Each piece of timber furniture from The Solid Timber Man recycled range has been pre-coated twice with Cutek oil. Cutek is a high grade petroleum based oil designed to penetrate deeply into any species of timber, including hardwoods, to provide water repellency and assist with dimensional stability. 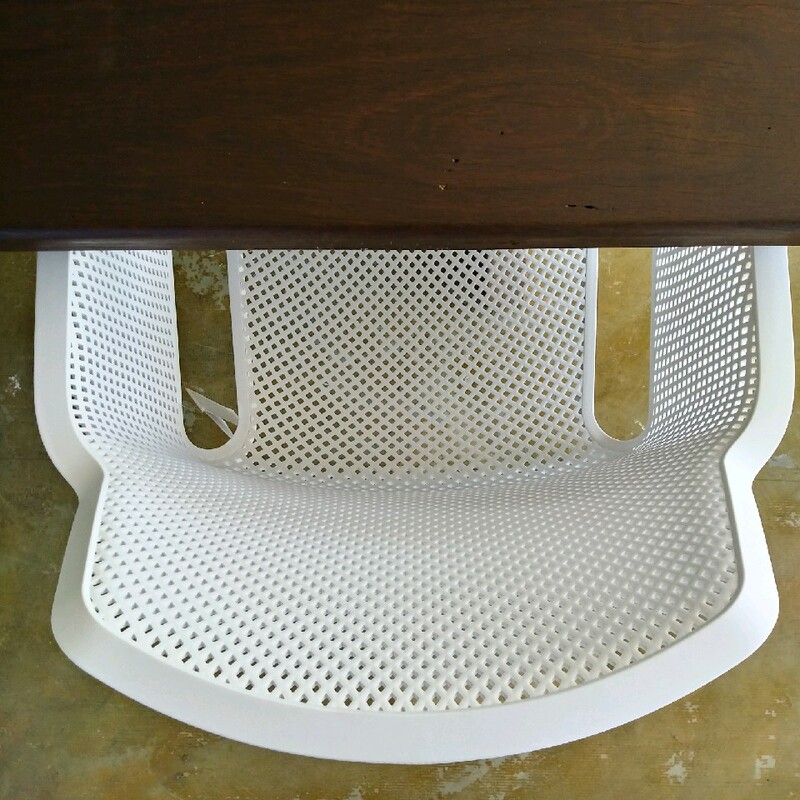 Configurations are based on 600mm width chairs along sides and one on each end. The Solid Timber Man range offers well-designed, robust and long lasting Australian made furniture for a reasonable price.